Info: Created on 16th January 2013 . Last edited on 20th January 2013. NB: IMHO, the "tails" of some glyphs can collide with the next one, you see? Look at this for a minute, please. My 10 -> U! Great technique, great italic, great font. One thing, maybe "Q" can be more stylish? @four: I removed the fins from V,v. f will have some spacing isuues if I put it on a baseline. @elmoyenique: I know what you mean. I fixed it, and this font is best when UC-LC, don't type only uppercases. I think I like italics too, for this isn't my first italics font. @Frodo7: Removed some fins and tails. @cablecomputer: I'm actually ok with Q, but I'll try to find an alternative. (and also for "g"). Excellent! V/v look a bit thicker, but I don't know if there's any better solutions for them. This is just really, really amazing. 100/10! I love italic fonts. Congratulations! FontStruct Staff have deemed your FontStruction worthy of special mention. 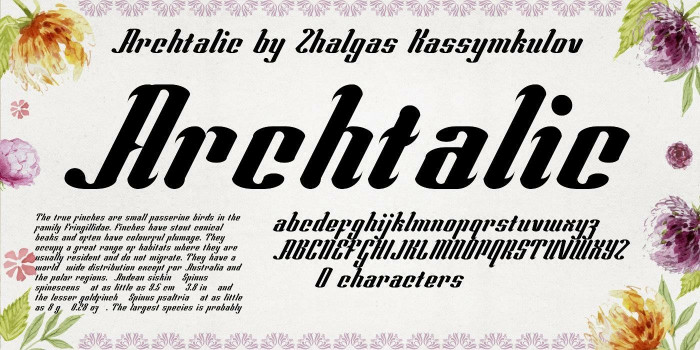 “Archtalic” is now a Top Pick. You become my top fav fontstructor, great job ! !